Throughout my whole life I've had fine nonvoluminous hair that is prone to being oily. I've heard time and time again that I should try washing my hair every other day rather than everyday, but my hair is so prone to getting oily that I have to wash it every 24 hours or else it gets a little gross looking. Lately I've made it a personal goal of mine to explore hair products that would curb my scalp's oil production while also adding much needed volume to my hair. 1. 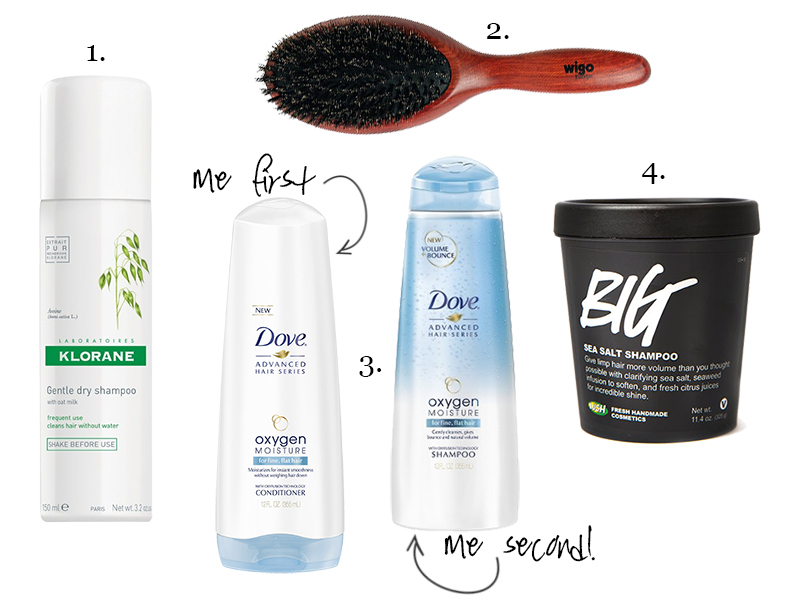 Dry Shampoo - This is probably an obvious product to feature in this post, but there is a reason why! 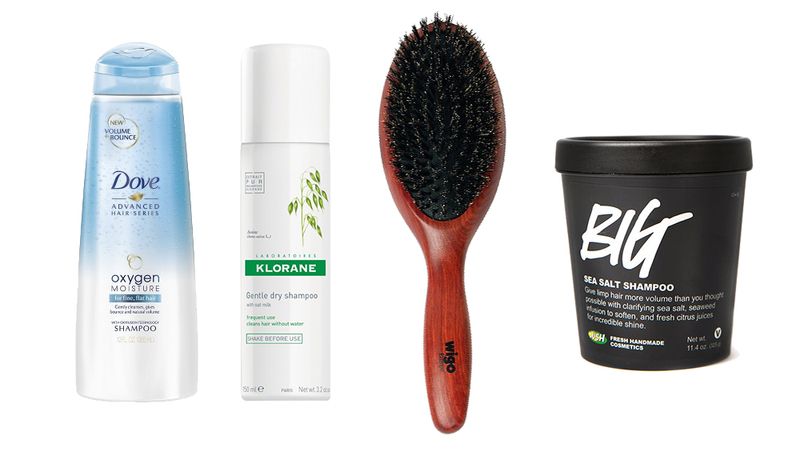 The purpose of dry shampoo is to keep your hair looking clean and refreshed in between washes, but for gals with oil-prone tresses, it's great for everyday usage because it helps keep the oil at bay. Just like how you would set a makeup-setting spray to ensure that your makeup goes the extra mile, it's the same concept with spritzing on some dry shampoo even if you washed your hair that same day. 2. Boar's Hair Hairbrush - Throw our your normal hairbrush because most plastic bristled brushes just won't cut it for fine and oily hair. Instead, invest your money in a boar's hair brush. When fine hair is brushed with a boar's hair brush, it really separates out each hair so that you get that desperately needed extra volume. Secondly, boar's hair naturally spreads the oils in your hair evenly from root to tip. 3. Reverse Washing (Shampoo / Conditioner) - I'm going to tell you my biggest secret in how I tackle my fine and oily hair; reverse washing. What that means is that when you wash your hair, you use your conditioner first and your shampoo second. This way, it prevents the conditioner from weighing down your hair. Let's face, it no matter how "light" the conditioner is, if your hair is fine and oily, essentially anything and everything conditioning weighs it down. Shampooing last helps you retain more of that much needed volume. I personally rinse off the conditioner before the shampoo because that works better for me, but you could also co-wash and use the shampoo to wash off your conditioner. Lastly, as a more well known tip, don't condition your roots! 4. Clarifying Shampoo - Those of us with fine and oily-prone hair should make it a ritual and a priority to clarify our hair once a week. It gets rid of all the oil buildup from the week, and it allows our normal shampoo and conditioner to work better. My personal favorite is Lush's BIG sea salt shampoo. This salty concoction smells pretty terrible, but it makes your hair squeak with cleanliness (literally). I'm glad they were helpful! Definitely try reverse-washing if you have an oily scalp! It makes a huge difference. Lastly, thank you so much for nominating me Stella! I'll definitely be posting my VBA Award post soon!